This past winter I made an easy White Chocolate Peppermint Fudge recipe and have since had visions of other varieties dancing in my head ~ this Oreo Cookies and Cream Fudge being the front runner. From cupcakes to cookie balls to muffins, we love our cookies and cream desserts! The combination of Oreo cookies with white chocolate is always a favorite and is bordering on addictive in this fudge. There are big chunks of cream-filled chocolate cookies in every bite, which is not only delicious, but looks pretty too! This easy dessert requires no candy thermometer and uses only 4 simple ingredients. The hands on time for Oreo Cookies and Cream Fudge takes less than 10 minutes, and then simply just chill to set. 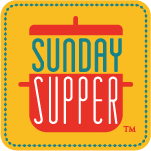 The theme for Sunday Supper this week is recipes with 5 ingredients or less. Since I’m all about simple, quick and easy recipes, this theme is right up my alley. There is a lot to check out this week, with wide variety of Appetizers, Sides, Main Dishes and Desserts and Drinks, all with short ingredients lists. Enjoy! Line a 9-inch square baking pan with waxed paper and set aside. Put white chocolate chips, sweetened condensed milk, vanilla and salt in a heavy sauce pan over low heat and cook until melted, stirring occasionally. Remove from heat and stir in cookies. Pour into prepared pan and then refrigerate until firm (at least 2 hours to overnight). Cut into squares. Ok… I am making this. My husband ADORES cookies and cream anything, so I will have to surprise him with this! Thanks Alida! These are just gorgeous…if my daughters see this after breakfast (cuz this is the recipe they would be bring to me from Pinterest)…I may be having them after lunch! Yay!!!!! Wow! Just beautiful! They look snowy white and I can only imagine how wonderful your fudge must taste!! Oh wow. I’m a speechless. Those look to die for and heavenly. Totally pinworthy! YUM! Cookies and Cream fudge, yes please. My Oreo loving family would love this fudge!!! I still have some Easter fudge leftover, so this will be up next! Where should I send my mailing address? This looks awesome! These are dangerously easy. I have all this in my pantry right now..perhaps, fudge-making is in the cards today 🙂 It looks delicious!